Don't know whether it is old hat but was discussing with dealer D4 vs D5 and said I would watching to see if the new Defender top of the range model would satisfy those that prefer the D4 - ie big box shape, big access to rear and maybe even split tailgate. He said it would come in at least five varients including short, medium and long wheelbase. .
2016 D4 Landmark Club Waitomo ...or is it Club Tempest???? Three version of short medium and long wheel base, ie basic, medium and top spec of each wheel base is the rumor. In the Beginning there was nothing, which exploded. is it going to be on a totally bespoke platform or the same one as the D5, RRS and FFRR? We all know a new Land Rover Defender is coming, but now it's really starting to set in. Dr. Ralf Speth, head honcho at Jaguar-Land Rover, confirmed today that the new Defender will launch in 2018, based off the new Land Rover Discovery. Speth told Autocar the new Defender would used the aluminum architecture found in the new Land Rover Discovery, Range Rover, and Range Rover Sport. Despite the cost-cutting chassis sharing, Speth confirmed to Autocar that the new Defender will be "fairly different" from every other model in the Land Rover range, range, with supreme off-road abilities as you'd expect from a Defender. "There is no question of the new Defender just being an icon. We are working on an authentic successor to the old Defender," Speth said. "The architecture will contain a lot of elements that are different [from other aluminium cars]," he said. As long as the new defender doesn't have a roof rack i will be happy. 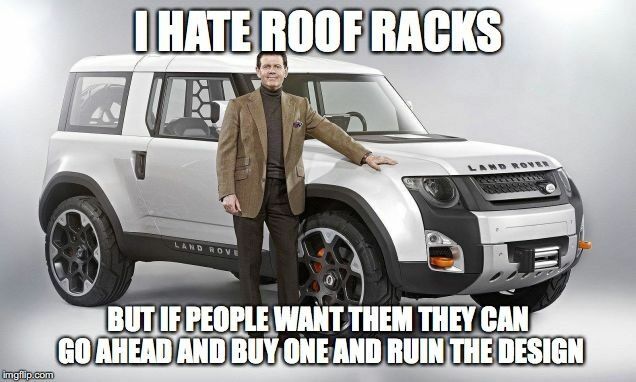 I hate roof racks, they ruin the design. I would imagine bespoke but similar concept In the Beginning there was nothing, which exploded. thats actually a great idea.